Odournet France experts interviewed in Expression Cosmetique magazine. Odournet France participated in the article titled, “Neutralize odours: What are the technical challenges?” which appeared in the December 2016 edition of ‘Expression Cosmetique’ magazine. In an article examining the neutralization of odours, Charlotte Tournier, Product and Material Sensory expert at Odournet France, explains how Odournet uses its sensory and molecular services to help evaluate the efficiency of new technologies to neutralise bad odours. 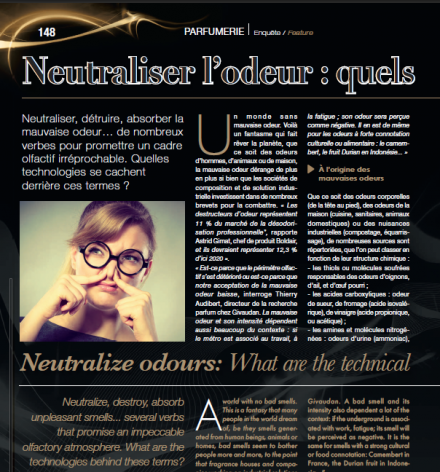 An article titled: “Neutralize odours: What are the technical challenges?” of ‘Expression Cosmetique’ magazine.